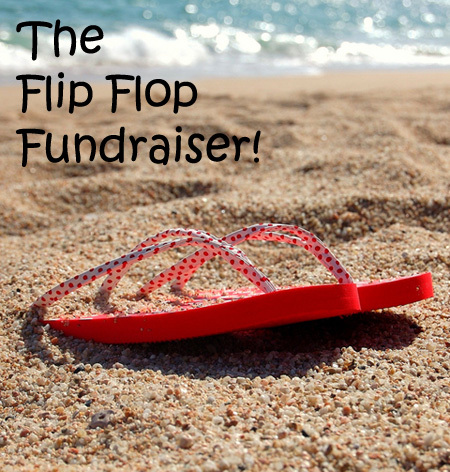 Let's have some fun in the sun - with a Flip Flop Fundraiser! A simple idea that will be great for schools, groups and organizations that live in hot climates. It's a sales based idea where you will sell (or take pre-orders for) branded Flip Flops. Sell them to your members, supporters, and the public through multiple methods! A simple enough Apparel Fundraising idea, right?! And What Funds Can You Raise? The potential of this fundraiser is actually pretty good! Generally your profit margin will sit at 30-50%, but can sometimes reach as high as 70% depending on where you source your Flip Flops, and on how many you sell. If we use a 40% profit average and each Flip Flop sells for $15. You then have 20 sales participants who sell 10 Flip Flops each: You'll raise $1200. But if you have 50 sales participants who sell 20 each: You will then raise $6000. And with that many sales you will most likely increase your profit margin as well. There are many ways of sourcing your Flip Flops, and many fundraising product companies have a program for it. 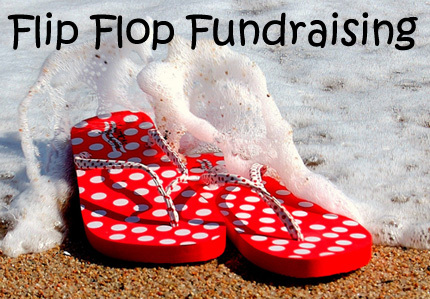 For example ABC Fundraising has a Flip Flop Fundraiser program that is reported to be of good quality and provides a decent profit potential. It is also a Brochure Program, which means you will take orders before purchasing the Flip Flops, eliminating upfront costs! With a sales based fundraiser it is always important to have a fully equipped and prepared sales team. So find some volunteers or recruit your students/youth if you're a School or Church, and unleash them on the public to take orders. Obviously you will need to prepare them with a basic sales pitch guideline, and give them tips and instructions on how to go about making sales. Remember: The more sales participants you have (and the more prepared and therefore successful they are); the more funds you will raise! You should also setup highly visible sales stands at 'high traffic' locations - Such as local shopping centers/malls, events, and local markets or fairs. And what you're fundraising for. Make sure you do this in a creative way that grabs attention and prompts people to approach your stand and purchase your Flip Flops. You should also have your sales team walking about at the location speaking to people, directing them towards your stand, or taking direct orders/sales from them! Increase your fundraising potential by providing a way for supporters to order online. Many people are shopping online and this will provide that additional avenue of sales to boost your funds raised! It will also make it easy for people who see your online promotions to order. They can essentially click from the promotion and buy! The last tip is that you must raise as much awareness about your Flip Flop Fundraiser as possible. The more people that know about your fundraiser, the more who will likely support you and purchase a pair of Flip Flops! So take a read through the Promoting a Fundraiser article to find the best ideas for successfully marketing your sales fundraiser!!! I wish you all the best of luck with your Flip Flop Fundraiser!! !